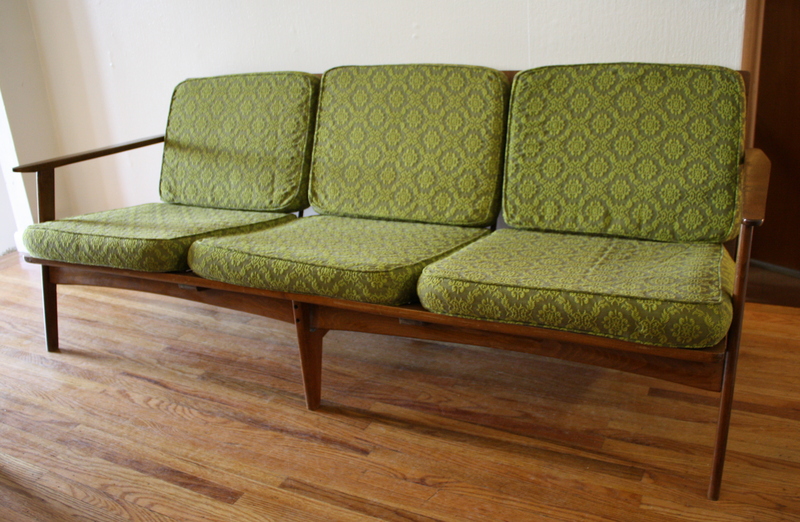 This is a mid century modern tufted sofa with upholstered bentwood arms and tapered legs. It is upholstered in a cheerful sunflower yellow tweed. Dimensions: seat width: 72.5″, seat depth: 20″, seat height: 15.5″, back height: 30.5″. 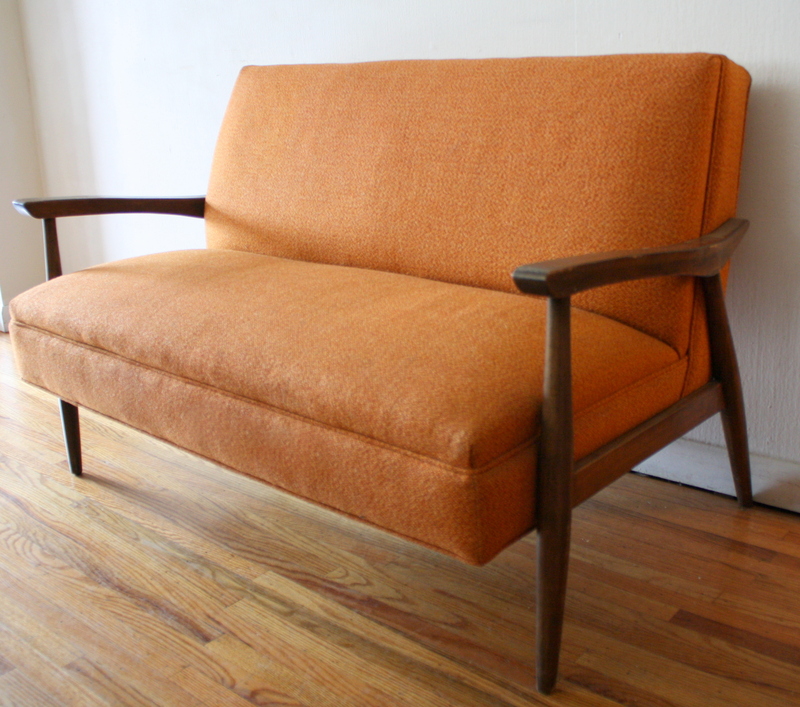 This is a mid century modern settee upholstered in an orange tweed with a solid wood frame. Dimensions: 42″ seat width, 17.5″ seat depth, 16″ seat height, 29″ back height. 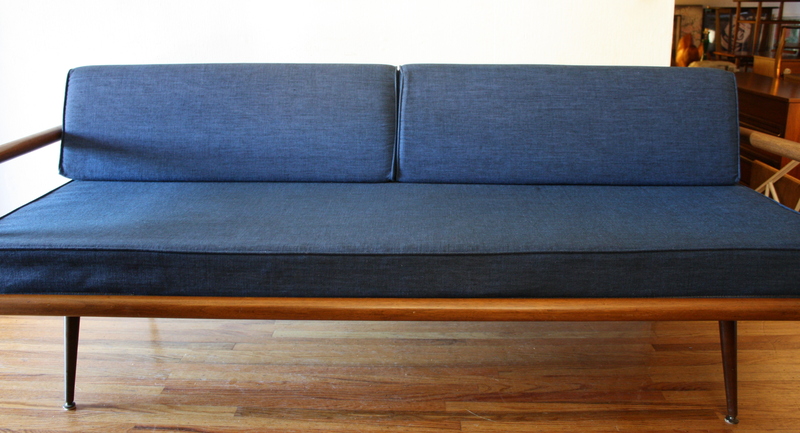 This is a mid century modern sofa couch that has upholstered cushions in a beautiful cobalt blue tweed. It has a solid wood base with arms, slanted back cushions, and splayed legs. Overall dimensions: 78″W x 32″D x 28.5″H. Seat measurements: 72.5″ seat width, 21″ seat depth, 17″ seat height, 28.5″ back height. 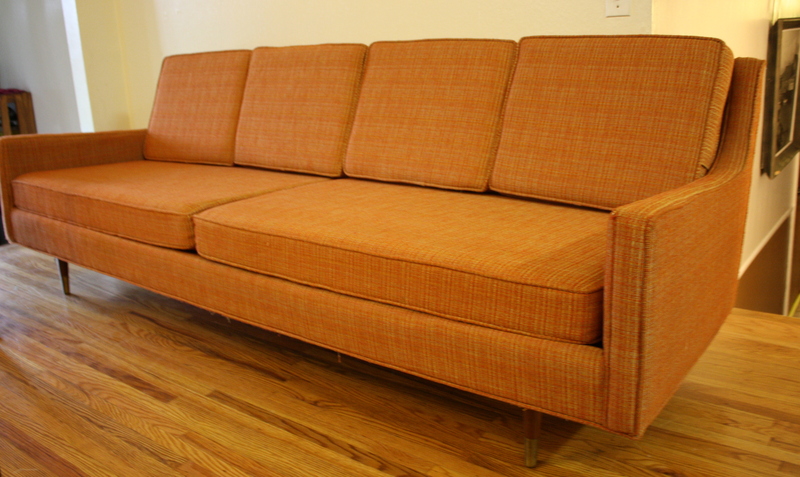 This is a mid century modern sofa in woven orange tweed and tapered legs. It has a great look and is very comfortable. This is a mid century modern sofa with fantastic upholstered cushions. They are original and in really great condition. 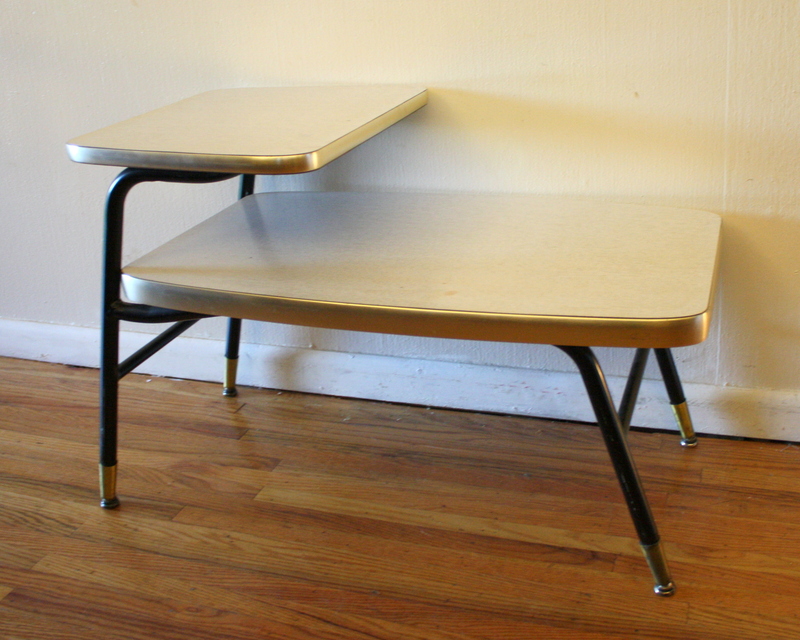 The frame is solid wood and has angled tapered legs. The sofa has a wonderful style and is very comfortable. This is a vintage retro settee with a matching side table. The settee is covered with black naugahyde and white piping with chromed arms and legs. There is some surface wear on the armrests. The two tiered side table also has a metal base with white formica tops. Both pieces are perfect for smaller spaces. 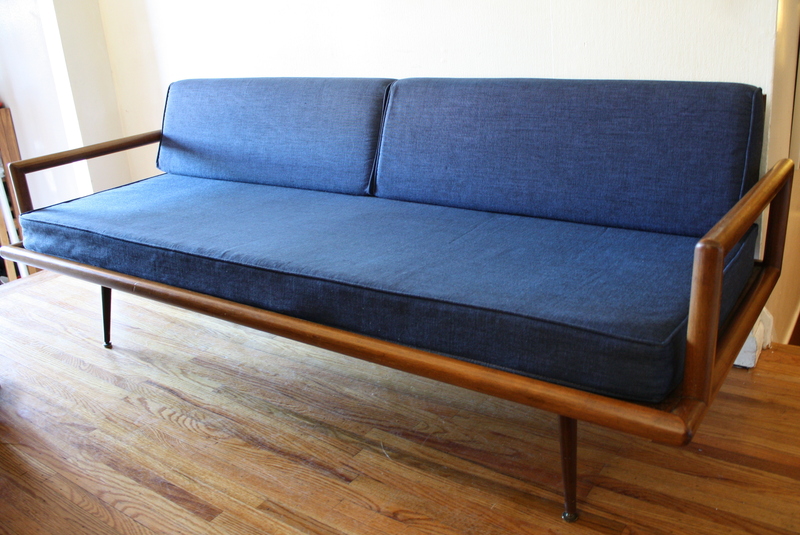 This is a mid century modern couch in beautiful condition. It has great wood accented arms, tapered legs, and is a vibrant orange. The couch is very comfortable to sit in and we love the design. This is a mid century modern settee in black vinyl. It has a great simple streamlined look and is very comfortable. Perfect for small spaces and accenting a room. Sold in a Picked Vintage sale featured on Fab.com. This is a mid century modern streamlined sofa with a solid wood frame and a cheerful retro striped tweed. Great Mad Men look. Have a seat, sip a martini and just lounge. This is a Percival Lafer style naugahyde suspension sofa. It’s super comfortable with great support. Curl up with your favorite book, watch a movie, take a nap!